Happy New Year everyone! I hope you all had a restful, joyous holiday season full of delicious food. My immediate family resides in Ohio, so I was there for about 10 days delighting in family recipes. This holiday was different for me, however, as I met my boyfriend’s family for the first time! His parents are from Shanghai and have resided in Atlanta for a long time now. His mother has the reputation for being an amazing traditional Chinese chef, so I was even more elated with the opportunity to bond and learn a few things from her repertoire! My flight was delayed four hours, but this did not deter me from missing lunch. Thank goodness. First, I witnessed Mrs. Chang make scallion pancakes. Her version is a little puffier than you’ll find in Chinese restaurants, but the flavor is the best I’ve tasted. She uses bread dough, fresh scallions, black sesame seeds, and sesame oil to create this masterpiece. The pancakes are placed in a skillet with a little olive oil and water. The pan is then covered so that the pancakes steam until the water evaporates. The heat is then turned on low so that the pancakes have a chance to brown on both sides without getting burned. Note: I am going to attempt these recipes for myself and then provide the full recipe on the blog to be sure I convey the best tips and tricks. 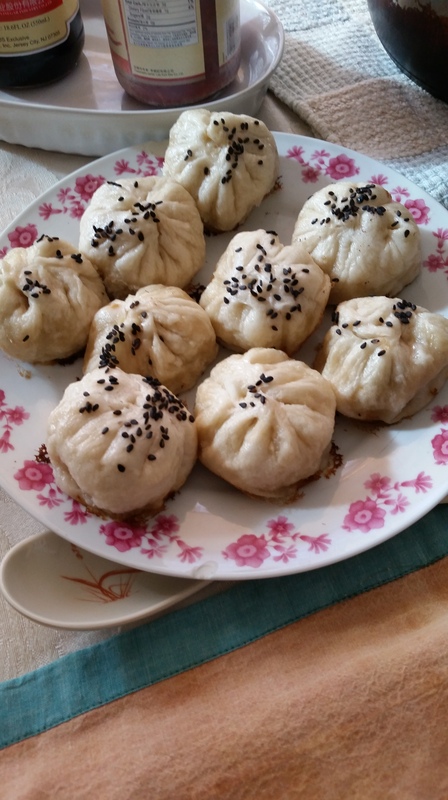 Then I watched as she created steamed pork buns, or shengjian bao. She used the same dough for these as for the scallion pancakes. The dough was broken apart into small balls and rolled out to be round and flat, about the size of a typical sand dollar and about a quarter inch thick. The main ingredients for the filling include ground pork, ginger, garlic, scallion, sherry, one egg, salt, and pepper. From what she told me, I am going to recreate these myself and post the recipe with exact ingredients and measurements. She put a small amount of the ground pork filling in the middle, and then made folds upwards that met in the middle. 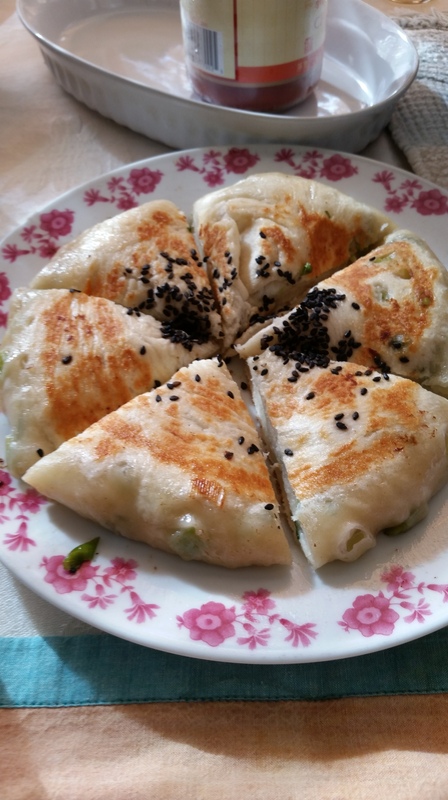 The buns are cooked the same way as the scallion pancake, with oil and water until the water evaporates, and then the bottoms are browned on lower heat. The next day she taught me how to fold wontons and make wonton soup. Mrs. Chang used Twin Marquis wonton wrappers from the Asian supermarket. These have the same filling as the steamed pork buns. You just put a little filling in the center of the wrapper. Take a little water and wet the top edge of the wrapper. Fold the bottom edge of the wrapper “hamburger style” up so that it meets the dampened edge. You then fold the top edge in towards you, and finally fold the two sides down so that they meet at the bottom. You wet one of the edges and then press them together. They kind of look like Italian tortellini! 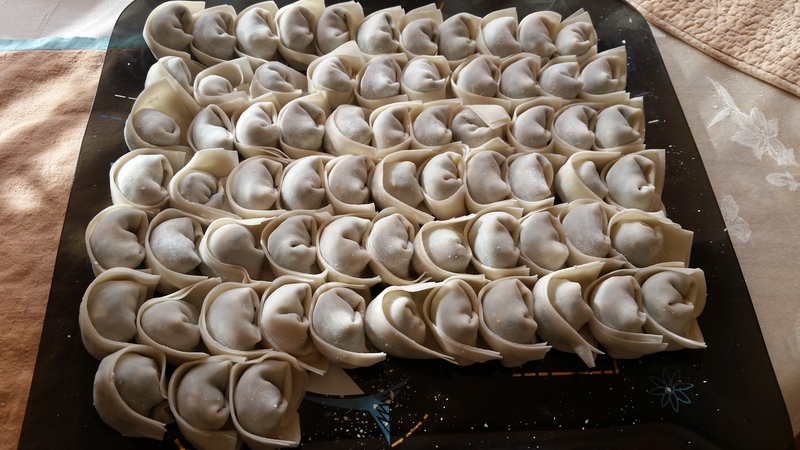 The wontons are then boiled in water until they float to the top. In the meantime, take your bowl and add salt, pepper, sesame oil, fresh scallion, and fresh ginger. When the wontons are done cooking, all you do is ladle the wontons with the hot water into your bowl. So easy! 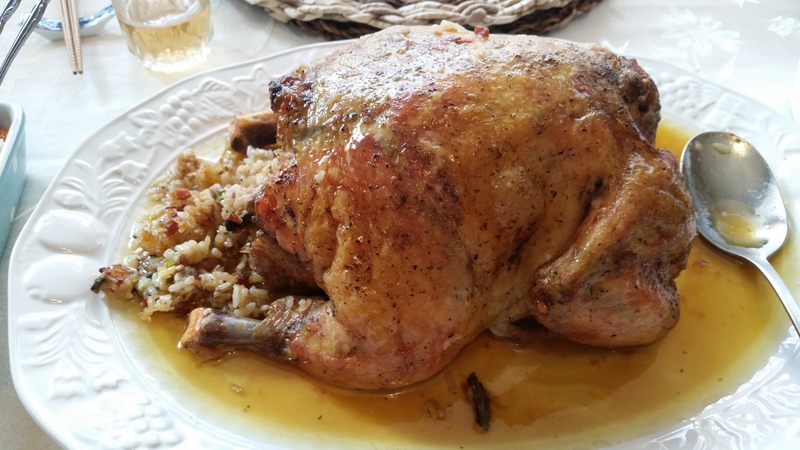 Finally, one of the best lunches we had there included a roast chicken stuffed with fried rice. Oh my goodness gracious. The chicken was marinated overnight and came incredibly tender. The fried rice absorbed the flavorful juice from the chicken – need I say more? Again, once I gather exact measurements and ingredients, all will be revealed on how to make this! 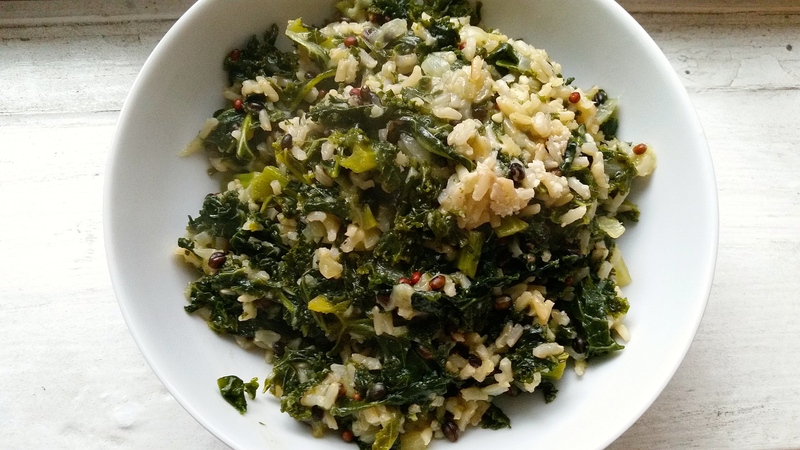 What new things did you learn while cooking over the holidays? I hope these discoveries inspire some of your culinary adventures in this new year! I started cooking on my own in my Junior year of college. A rookie to the core, I tried tackling complicated recipes in an effort to prove myself. One of my major mistakes occurred when I defrosted a chicken breast for too long. I left the poor raw chicken breast out all day (for more than eight hours) to thaw. When my Mom told me the chicken wasn’t safe to eat, I cried. Tears fell down my cheeks. Oh goodness. Cooking chicken is an interesting endeavor, one that requires immense experimentation. Boneless, skinless chicken breast can dry out so easily in the oven. Chicken breast on the bone comes out more tender and juicy, but it takes much longer to cook. For anyone on the go, you have to remember to defrost your chicken promptly, putting it in the fridge the night before so that by the next day’s dinner time it’s ready to go. And that’s when I say…why all the hassle? Sure, it’s nice to bake chicken in the oven, but when you are strapped for time, there’s another way. Buy a rotisserie chicken. Rotisserie chickens at the grocery store are usually $6-8 and give you plenty of meat when pulled apart. My suggestion: Pull apart a rotisserie chicken, separating the meat into individual portions in plastic bags. Freeze these bags and take out one when you need to make a dish. This is incredibly useful when making chicken enchiladas, jumbleaya, fried rice, etc. You can put the frozen meat straight into a pan and it will thaw out perfectly. My parents are true wine connoisseurs. I grew up watching them drink specialty wines from around the world. The wine cellar in the basement always awed me as a child. I’d sometimes sneak down there and just look at all the bottle designs and their origins. Memories in the kitchen include having my Dad let me smell the wine and guide me towards what my olfactory senses should be identifying. Wine is made out of grapes, yes, but so many more factors combine to create a unique taste. The species of grape, the soil quality, the type of wood in the aging barrel…it all matters. When I came of age to drink, my taste buds began to mature. At first, I could only handle Moscato and Reisling wines, fruiter varieties that are light and sweet. Though I’m beginning to venture into red wines, white wines are still my favorite to drink. Chardonnay in particular goes well with happyhour, with fish, or even just by itself. Rombauer Vineyards in St. Helena, CA makes the most amazing Chardonnay I’ve ever sipped. The wine is smooth and buttery, with hints of fruit and wood. As you can see, I just returned from Cape Cod where my parents were vacationing. We partook in a chilled bottle with our happyhour and baked fish (that post is coming soon)! If you can find this wine for around $30.00 – $36.00 a bottle, you have yourself a good deal. 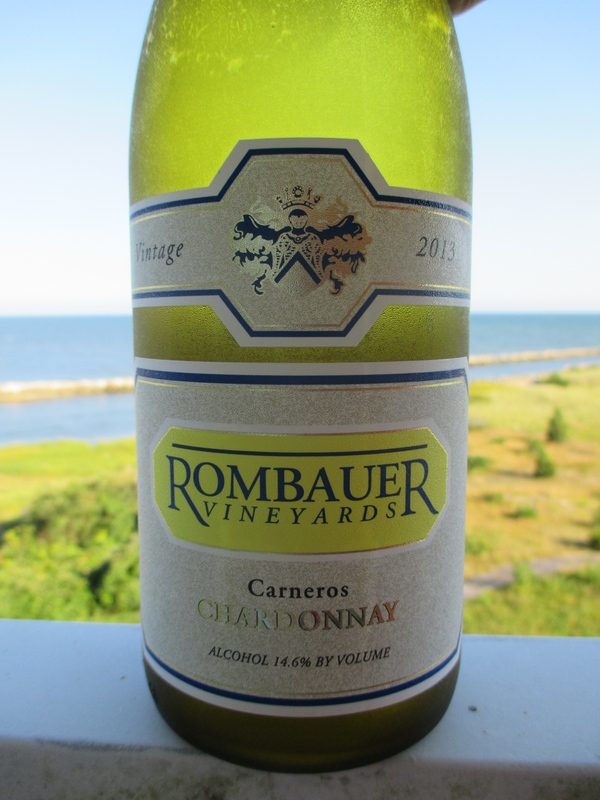 This is a more expensive wine, but if you need to buy a white wine for a special occasion or if you just want to plain treat yourself, I highly recommend Rombauer Chardonnay.